Every once in a while it happens that there's a place you've visited many times, thinking you know it well, and then you realise that there's something you've missed all along; that there's more waiting to be discovered. I'm sure every Londoner has experienced this before. This city just loves surprises like this, doesn't it? And so London surprised me with the Garden of St John's Lodge in Regent's Park. 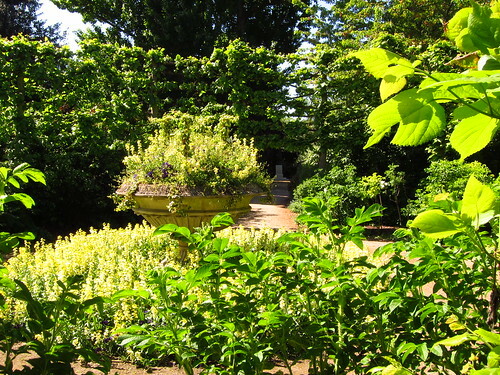 It's also known as The Secret Garden, rightly so, I guess; I'd been to Regent's Park many times before, and never knew this garden was there until recently, when I read more about the history of the park. When John Nash designed Regent's Park in 1811, he envisioned a residential development with a summer palace for the Prince Regent and several villas for his friends. Much of this scheme was abandoned, the palace was never built and only eight of the 56 planned villas were completed. Two of these original villas remain today–St John's Lodge and The Holme. St John's Lodge was completed in 1819. It was in private hands until 1916, when it was used as a hospital; later it was used by the London University. It is a private residence again today, belonging to the Sultan of Brunei. The grounds of St John's Lodge had an informal layout until the 3rd Marquess of Bute purchased the lease in 1888. 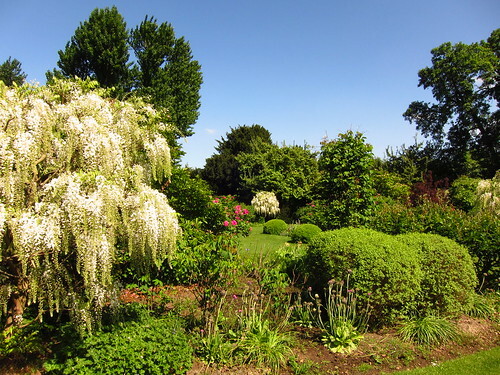 Lord Bute commissioned Robert Weir Schultz to design a new garden 'fit for meditation'. Weir Schultz landscaped the garden by arranging shaped spaces on the axis of the villa; he created a sunken lawn which extended from the villa's forecourt to a circular garden, with an oval tennis lawn beyond. These gardens were connected by a stone loggia, while a nymphaeum stood at the end of the oval garden. This is still very much the layout of the garden, which became public in 1928, today; some features, such as the stona loggia and the nymphaeum were lost during a recline between the wars in the last century. A statue of St John the Baptist, the central point of the circular garden, was also lost and was replaced by the statue of Hylas and the Nymph. As you enter the garden from the entrance off the Inner Circle, there's a pergola walk leading to the large circular garden, which has a pond with the statue of Hylas and the Nymph in the middle; to the left, there's the sunken lawn with St John's Lodge beyond, while to the right, there's an arbor through which you enter the secluded oval garden. 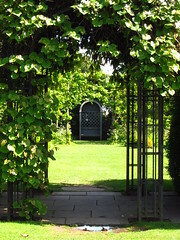 The arbor replaces the stone loggia. At the end of the oval garden, there's a covered seat where the nymphaeum once stood, forming the focal point to the axis of the villa. 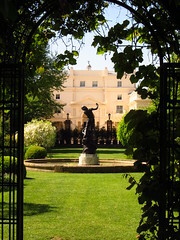 There's another smaller circular garden, with a circle of lime trees around a stone urn, and a gravel path, linking this smaller garden to another statue, the Shepherdess, off the larger circular garden. 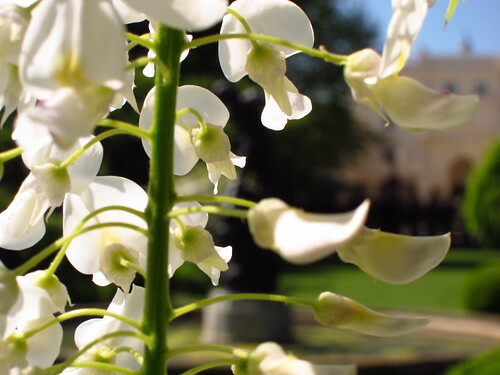 The Garden of St John's Lodge is open daily, during the opening times of Regent's Park. The garden is located off the Inner Circle, near its junction with Chester Road; the Park Office is nearby. Oh this looks so pretty! I must try to find it. Not so secret now is it! I've been visiting Regent's Park since I was a child and I can't believe I've never come across this garden! Thanks for the tip and lovely photos! 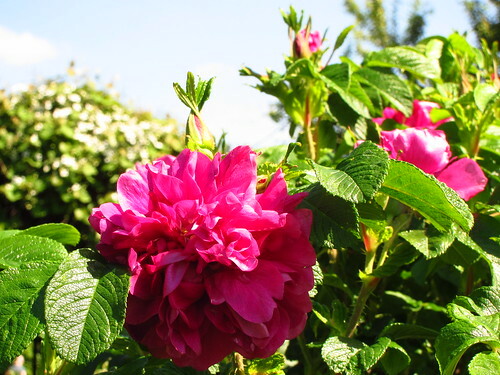 When I read about this garden and found it a few years ago I felt it was my secret! So yesterday I walked and walked, and couldn't find it but I walked more of The Regent's Park than I have since I was ten. And it was beautiful. I will find the garden this morning before I catch my flight out.